After a while (not even that long in all honesty), the quick-drying saviour that is Seche Vite starts to lose it’s magic. The formula thickens, goes stringy, straggly and gloopy. Quite literally, it becomes unusable and you end up turning the air blue after it ruins the manicure you’ve just spent the last 40 minutes applying. There is a solution, although it comes at the cost of having to buy another product. 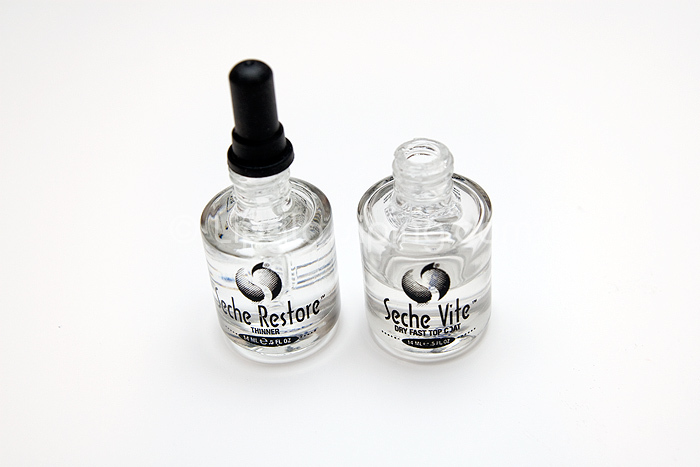 Seche Restore is a thinner designed to breathe life back into not only your bottle of Seche Vite, but other polishes that thicken over time. 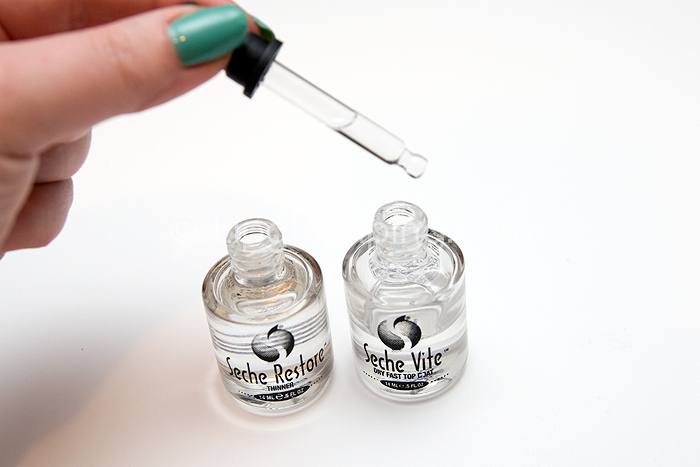 Taking the dropper, pull some of the thinner into the chamber and simply drip about 6 drops into your bottle of Seche Vite. 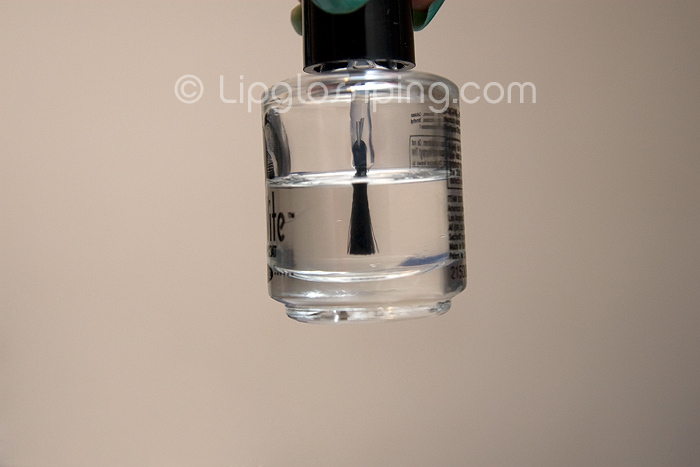 How many drops of thinner you need to add will depend entirely on how gloopy your Seche Vite has gotten. I needed to add quite a few… (more like 14/15 overall). The thinner liquid will kinda sit on top of the Seche Vite, so you need to take the bottle and gently roll it between your fingers, encouraging the thinner to mix with evenly through the top coat. And you’re done! Check consistency until it’s as you remembered it. If it still seems gloopy… add a bit more! Why is the brush so darn stumpy and what am I supposed to do when the level goes below it huh? huh? I bought my bottle of Seche Restore on eBay and paid around £8 for it inc. postage. I’d rather not have to… but the bottle will last me a hell of a long time and I’m sure I’ll put it to other good polish-restoring uses aswell… now where did I put those gloopy Ciates? I got my Seche Restore together with Seche Vite on eBay too, from an American seller, and both had cost me around 2.50 GBP each. With p&p I think it worked out at around 5 quid per bottle – great value if you ask me. I had no idea there was a product that did this! So many nail varnished thrown away when they could have been rescued…. I use Out the Door, which I get at my salon. Much better than Seche Vite. Also, I use the Solar Oil drops on top of the top coat. Works a treat. I agree with the brush thing, next thing I’ll be doing is pouring it onto something so I can use it all lol. Jane – you shouldn’t use nail polish remover to thin out your polish as it ruins it. I STILL have not tried this and I LOVE painting my nails…I absolutely love the nail base called ‘gelous’ also from Sally’s it really prevents nails from chipping. P.s. I always admire your nails in your posts, they are beautiful! I’m wondering whether any thinner will do, not necessary being a Seche – for money value My Seche Vite turns gloopy as well, so thanks for this post. Never thought of it. re: stumpy short brush: they should totally do some long ‘disposable’ ones, which you can put into some solution to remove varnish from. I just dip a cotton ball into my nail polish remover and then squeeze it out into any nail polish bottles that are getting clumpy. A bit of rolling around, and I’m done! SO useful. Thank you so, SO much for posting, I honestly thought this was just me! 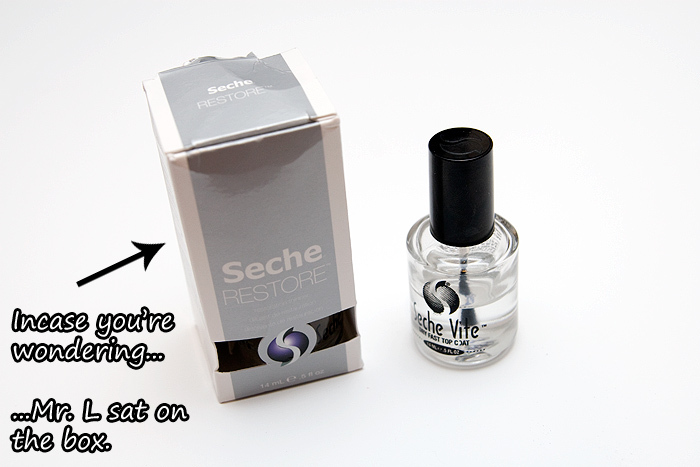 Great to know there’s a solution, because I love Seche Vite so much. NO. WAY. I gotta get one! I hate the thick goopy state my Seche Vite is in now! I also hate that stumpy brush! It makes no sense whatsoever. I’m a major cheap and what I’ve always done withh gloop polishes is add a few drdops of nail polish remover! Just a few drops, then sake for a bit, let sit, and it’s almost like new. Some products seem to require more than others depending on the formula, but it works for me a the quality I’m looking for. 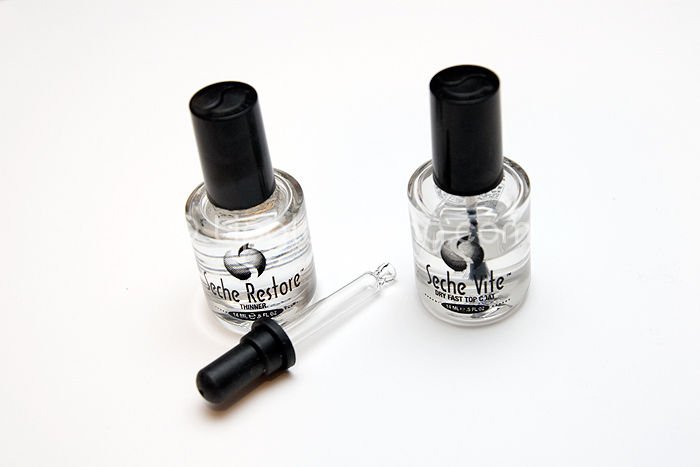 Do you know how Seche Restore compares with OPI thinners?